During the Christmas Holiday into early January, Sofia and her parents visited the family in Vlissingen, The Netherlands. We did visit Antwerp (very cold) but all got the flue afterwards and were in bed for several days. Not a successful trip. No eruptions on this field trip: As part of a unit on land formations, including volcanoes, the two third-grade classes at Sofia's school went on a 2 1/2-day field trip to Mt. 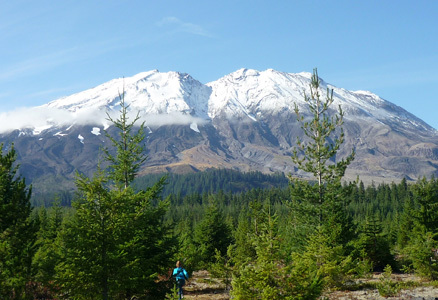 St. Helens in mid-October. Jan went along as Sofia's chaperone, and both had a very good time. They were very lucky with the region's October weather, which was sunny just long enough for the two days of hiking and exploring. The kids stayed near Randall at a cabin facility called Cispus. In the area, they explored the Ape Caves, the Trail of Two Forests, the Lava Canyon, and Windy Ridge. They also spent their evenings painting spirit stones, playing charades, making film canister volcanoes, singing campfire songs, and of course, eating s'mores. For weeks before the trip, Sofia had worried that the active volcano (last explosion 1980) would erupt and the trip would be cancelled. Fortunately, the mountain stayed quiet! Sofia (foreground) and Mt. St. Helens on a beautiful day. Spanish not in Spain: Soon after Amy and Sofia left for Arizona, Jan left for Panama, another trip organized before the summer-long European adventure had been arranged. His purpose was to attend an immersion Spanish class and do some low-cost exploring. He spent two weeks at the Habla Ya school in Bocas del Toro on the Caribbean side of Panama. The classes were well organized, and he spent time diving and boating to nearby palm-lined cays and beaches. He also enjoyed meeting locals and other students in the evenings. including a handful of colorful sailors who moored in the bay and rowed to Bocas for alcohol-fueled nightlight. After classes ended, Jan also spent three days in Panama City, where he saw the Miraflores locks, and another half-week in Mexico City with an old friend from Holland. Contrast in the desert: Before our intended 2-week vacation became a 2 1/2-month adventure, Amy and Sofia made arrangements to visit friends in Arizona at the end of August. So after sleeping in our own beds again (wonderful!) for just four nights, we took off in a plane once more. We visited old neighbors Trudy, Joe, and Joseph outside of Phoenix. The stay was quite a contrast from Gibraltar: Gib was so compact and urban that we could walk to reach or buy nearly everything we needed; Phoenix was so rural and diffuse that literally nothing could be accomplished without a car. And whereas in Gib the temperatures were typically comfortable in the 80s, in Phoenix we either stayed inside in air conditioning or were assaulted by 100+ degree heat for most of the day. Nevertheless, Sofia loved seeing her friend Joseph, and we had a great time visiting the Arizona Sealife Aquarium, the Arizona Science Center, and the cowboy town of Prescott. We swam in their pool every day and were treated so well in their beautiful house that it felt like staying at a spa. 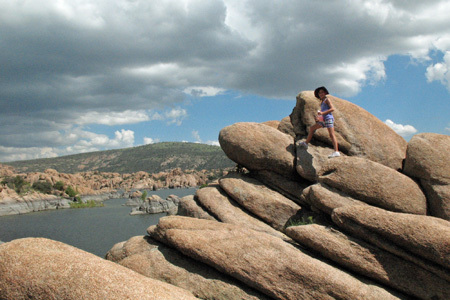 Sofia hikes in a park outside of Prescott, Arizona. Adventure of a lifetime:: On June 14th, Jan, Sofia and her mother left for Gibraltar. We did not return to the U.S. until August 25th. In between, we spent 8 1/2 weeks living in Gibraltar, 1 1/2 weeks visiting family in Holland, a week staying with friends in Málaga, and day visits throughout Andalucia, Portugal, and Morocco. Within in Spain, we visited, among others, Granada, Cádiz, Jerez de la Frontera, Ronda, Estapona, Sotogrande, Puerto Banus, and Ceuta. We toured the medinas of both Tangier and Tétouan, Morocco. And we strolled our way through Faro and Tavira along the southern coast of Portugal. In Gibraltar we rented a long-term condo in Ocean Village on the marina. Sofia's mother stretched the boundaries of long-distance telecommuting 20 hours a week and read a novel a week, Sofia went to sports camp each weekday morning and spent each afternoon at the swimming pool. Jan took Spanish language classes at the Cervantes Institute and searched for the perfect cup of coffee (no Starbuck's in Gibraltar!). We rejoiced at wearing shorts and sundresses in daily sun and 80-degee temperatures. We watched Wimbledon and the London Olympics in real time. And we walked, shopped, and ate throughout the nooks and crannies of the small but urban British protectorate of Gibraltar. 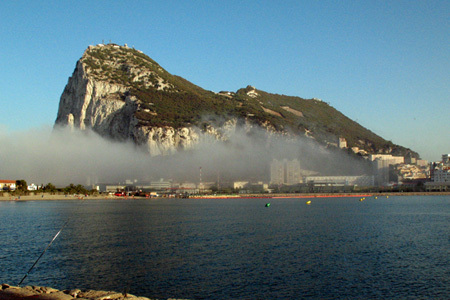 The Rock of Gibraltar with a rare bank of summer fog. 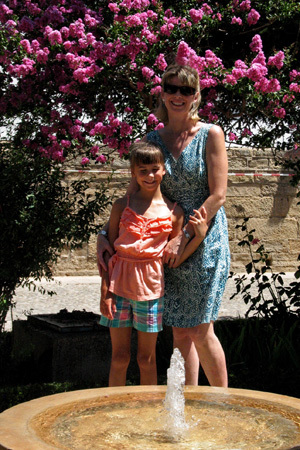 Sofia and her mother in the beautiful town of Ronda, Spain. 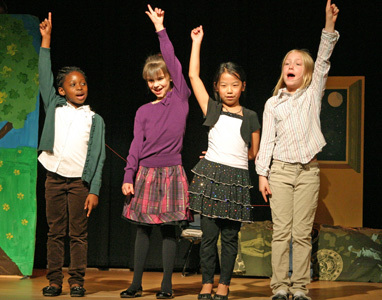 Flat Stanley in 3-D: Sofia's class produced a 20-minute play based on the Flat Stanley children's stories. Sofia played the part of a nurse and was one of three narrators. She did a great job making parents hear her in the Northshore Senior Center auditorium. Sofia and friends sing "Let's Go Fly a Kite" during the play. 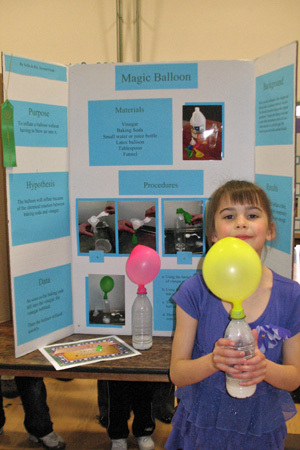 The magic balloon: For the school Science Fair this year, Sofia inflated balloons by using vinegar and baking soda. She made a nice display and demonstrated what she learned on the night of the fair. Good work, Sofia! Happy Easter: Easter was a happy day. Sofia woke up to a basket full candy and toys, including a diary with a lock and the Wii game Just Dance 3. The Easter bunny had hidden eggs all around the house. She found over 45 of them but continued to find them hidden for a couple weeks after. Breakfast consisted of fruit-laden hot crossed buns. At midday, we met Cameron for lunch out, and he received his own college-appropriate basket. It was a beautiful day—unusual for Easter in Seattle—and Sofia spent the afternoon playing outside with friends while Mom and Papa relaxed. 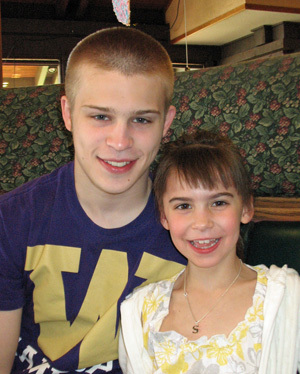 Cameron and Sofia out to lunch on Easter.